(File) Minister of Labour and Employment, Senator Chris Ngige, meets with ASUU leaders in Abuja on December 10, 2018. The Federal Government is resuming negotiations with the leaders of the Academic Staff Union of Universities (ASUU), today, to resolve all issues that have made the strike to linger. At a similar meeting with ASUU leaders on the 7th of January, the minister of labour, Dr Chris Ngige announced the release of N15.4 billion by the federal government for the payment of salary shortfalls, which is one principal demand of the striking lecturers. Its been two weeks after that meeting was held, and the strike has continued even though the president of ASUU says the national executive committee of the association will review their decisions based on the new commitment by the federal government at their last meeting. 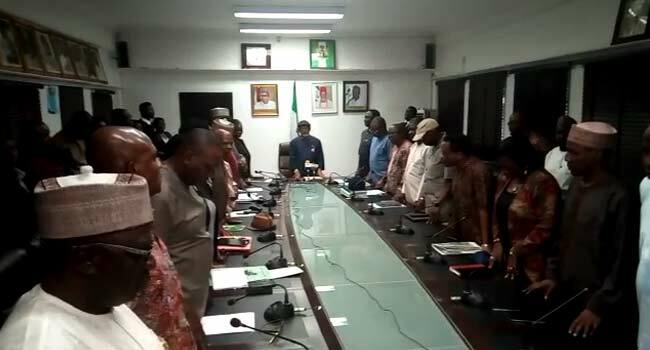 It is hoped that the resumed meeting will afford the striking lecturers brief the federal government about their new resolutions after considering the new commitments made by the government in their last meeting.